Humor and wonder make the world a better place. 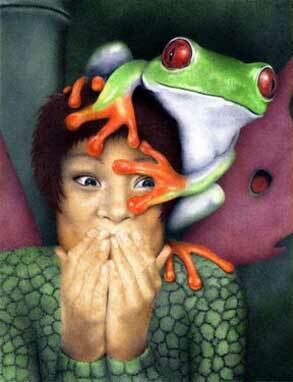 Tree Frog Faery and her friend remind us to have a look around and laugh at our own absurdity. The original illustration is 7.5"x9.5" and was created in airbrush and colored pencil. Tree Frog Faery is just one of the many endangered wonders of the rainforest that is often overlooked. I, for one, would rather live in a world with faeries and tree frogs than in a world with no magic at all.